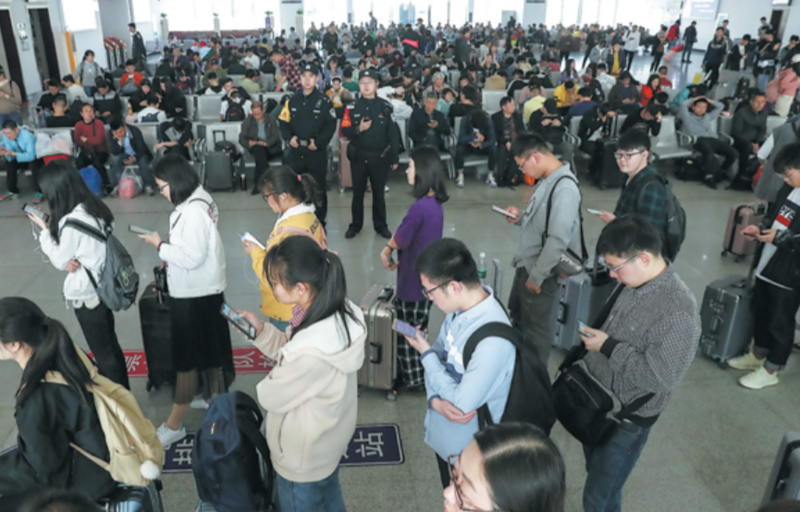 According to the State-owned railway provider, about 14.54 million visits would be made on Sunday, the last day of the three-day break, and 732 trains were added to deal with the rush. High-tech assistance was available to travelers, such as facial recognition speeding up entry and visual-reality navigation in 45 railway stations operated by the Wuhan branch of China Railway Corp.
Tomb Sweeping Day, or Qingming, is a traditional holiday for honoring ancestors and also a break for spring outings. This year, the holiday fell on Friday through Sunday. According to the Ministry of Culture and Tourism, Chinese visitors made over 112 million visits during the holiday, up 10.9 percent from last year. Revenue generated by the holiday travel saw a year-on-year rise of 13.7 percent, reaching 47.89 billion yuan ($7.14 billion). Online travel agency Lvmama, in Shanghai, said in a report released on Sunday that attractions highlighting cultural experiences or tea-picking activities were among the hottest destinations. Reservations for cultural attractions such as museums, temples and viewing cultural relics rose by 20 percent year-on-year during the break, and museum bookings rose by 17.8 percent. Li Qiuyan, Lvmama's branding development director, said the Tomb Sweeping holiday is a good time for spring outings and leisure activities. "Travelers are snubbing the attractions that offer only sightseeing activities, while pursuing cultural experiences with medium and high-end accommodations," she said. Opportunities to view blossoming flowers also attracted travelers. Yuantouzhu, a peninsula in Wuxi's Taihu Lake-one of the nation's largest freshwater lakes, in Jiangsu province-was among the top 10 hottest attractions because of its cherry blossoms, the report said. Other popular attractions during the festival included Shanghai Disney Resort, Mount Huangshan in Anhui province, and Happy Valley theme park in Beijing. Sun Jing, a 26-year-old woman from Shanghai, visited Xi'an, the capital of Shaanxi province, during the break. "The city is charming, with its long history and modern urban life, as well as its diversified snacks and world-famous Terracotta Warriors," she said on Sunday. "The only annoyance was that there were too many people crowding every attraction, but it's the holiday." The Lvmama report said that Thailand and Japan remained the two top choices for Chinese mainland travelers during the Tomb Sweeping holiday, followed by Indonesia, the Philippines, Hong Kong, Macao, Malaysia, France, Australia, the United States and the Maldives. On Wednesday, Ctrip, another online travel agency in Shanghai, estimated that Chinese travelers would make about 110 million visits during the holiday break to 790-plus domestic and overseas destinations in 88 countries and regions.